For some people, nothing is more satisfying than a hearty pancake meal in the morning. This high-carbohydrate breakfast can provide enough energy to fuel a day's worth of physical activity. But are pancakes healthy? Not always. But, if you love to start your day with a fluffy stack, there are ways to keep pancake calories and pancake carb counts lower so that you can include them in a balanced diet. Pancakes with traditional toppings like butter and syrup provide significant calories, fat, and especially carbohydrates. Since pancakes usually do not provide any fiber, you'll consume 90 grams of carbohydrate and 90 carbs when you indulge in this meal. But your total nutrition numbers will depend on your serving size. The numbers on the label (shown) only apply to a single serving of pancakes which is just two medium pancakes. Many hearty eaters consume 3-4 medium pancakes and double the amount of butter and syrup as well. If that sounds like your typical pancake breakfast, you'll consume over 1000 calories when you indulge. And if you add bacon or sausage, the number can skyrocket. If you consume two medium strips of bacon, you will add 74 calories, 6 grams of protein, 6 grams of fat and 2 grams of saturated fat to your meal. If you consume two links of pork sausage, you will add 88 calories, 5 grams of protein, 7 grams of fat and 2 grams of saturated fat to your meal. If you're interested in the number of pancake calories alone (no syrup or butter), it may depend on whether you make them from scratch or whether you buy a pre-packaged mix. One large pancake (7" across) made from scratch provides 186 calories, 4 grams of protein, 30 grams of carbohydrate, 1 gram of fiber, and 5 grams of sugar. A single serving of pancake mix is one-third cup which makes approximately four 4-inch pancakes. As prepared, pancakes from pancake mix will provide approximately 250 calories, 8 grams of fat, 8 grams of protein, 37 grams of carbohydrate, and 7 grams of sugar. You can also expect to consume about 800 milligrams of sodium per serving. What About Calories in Waffles? Often times, waffle batter is similar to pancake batter, so the nutrition profile doesn't drastically vary. Generally, a 7" round waffle offers 218 calories, 11 grams of fat, 25 grams of carbohydrate, and 6 grams of protein. Just like for pancakes, specific numbers will depend on the size and the ingredients used. You can make waffles with cottage cheese and flaxseed, for example, for added protein and fiber, for a morning treat with about 340 calories each. Pancakes will boost your carbohydrate intake for the day. Your body uses carbohydrates as a primary source of fuel, so this nutrient is important. But most nutritionists suggest that you get your daily carbs from the most healthy sources. Pancakes usually don't fall into that category. Pancakes and pancake mixes are generally made from enriched flour. Enriched foods are those that have had nutrients added during the manufacturing process. In most cases, the nutrients (like vitamins and minerals) are stripped away and then some of them are added back in during processing. Also, if you buy a pancake mix, you may get a dose of trans fat with your meal. Some brands include partially hydrogenated oils (trans fats). Health experts recommend that you limit or completely avoid foods with trans fat. So is there any way to make a pancake meal more healthy? Of course! If you include a hearty pancake breakfast in your weekly meal plan, try to follow a few smart tips to keep them lower in sugar, lower in fat and lower in calories. Make pancakes from scratch without the mix. That way you'll avoid any trans fat that may be hiding in the ingredients. Use whole wheat flour to get a little bit of fiber with your meal to boost satiety. Instead of frying your pancakes in oil or butter, use a quality non-stick pan to reduce your fat intake. Skip the syrup and butter. 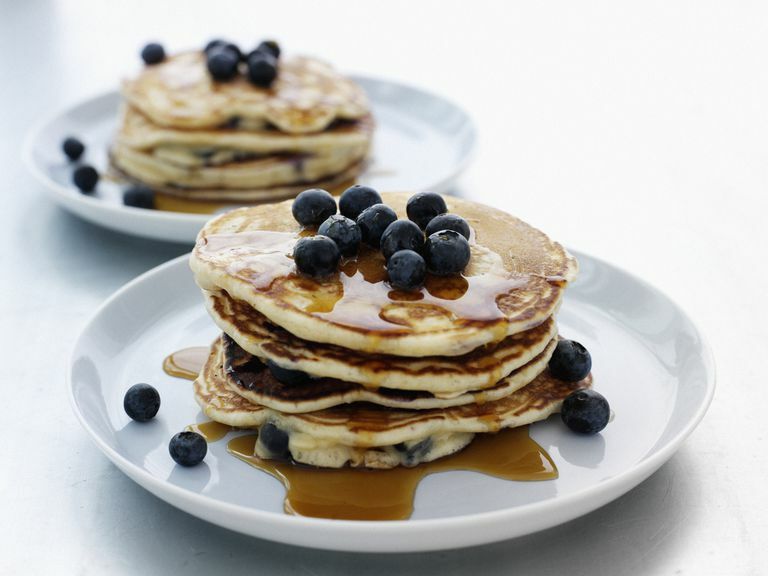 Top your pancakes with nutrient-rich blueberries, raspberries or strawberries. If you're ready to experiment in the kitchen and trying healthier pancake recipes, consider one of these versions to satisfy any eater. Remember that a single, indulgent brunch or breakfast is not likely to derail your healthy eating plan. But since pancake calories can add up quickly and pancake nutrition isn't optimal, this is a meal that you might want to enjoy sparingly. Try to add other nutritious breakfasts to your meal plan to keep your good health and your weight on track.